Tri-colored cat's eye pee wee marbles are approximately 10-13mm or 1/2" and smaller in diameter. They are clear marbles with three colors of veins in each marble. 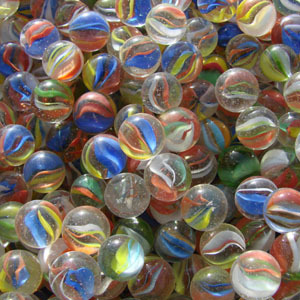 These marbles are sold by the pound or in an 1000 count bag. The 1000 count is an approximate amount and can weigh anywhere between 5 and 7 pounds depending on the color and size of the marbles. There are approximately 170 - 190 peewees in a pound. Sizes will vary slightly. Warning! : Choking Hazard. This toy is a marble. Not recommended for children under 5 years.